The roads and fields and forests of France that are today the perfect picnic spot to set up camp and awaiting passage of the world's greatest cycling race, were once fields of fire where killing the enemy was the only thing that mattered. But as time claims the last survivors of the Great Wars and rob us of their living memories, remembrance of the sacrifices of those thousands, which allowed cycling fans like us to enjoy the folly of Le Tour each summer, is even more important. 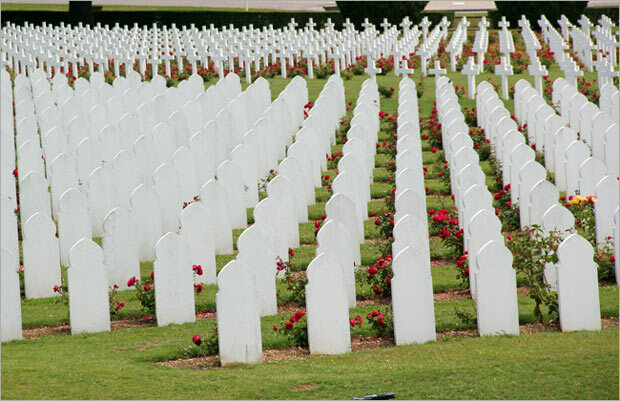 On November 11th millions of people living around the world will pause to remember the millions of lives lost in wars. What's known in the UK & Canada as Remembrance Day and in the US as Veterans' Day, began on November 11th, 1919, in England & other countries of the British Commonwealth, on the anniversary of the armistice that ended the fighting of World War I which was signed at 11th minute after the 11th hour on November 11th, 1918. While the name of the day varies across countries, it is observed in many nations. 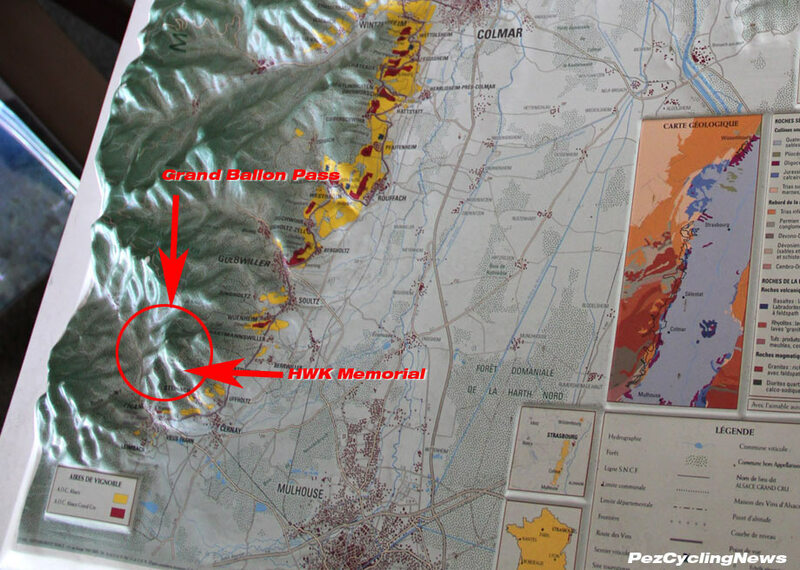 On the 100 year anniversary of World War I, the 2014 Tour de France paid its respects by visiting many of the historic regions and battlefields of the war. For me, chasing the race through regions where so many people had died was much more sobering experience than I'd expected from la grand boucle. 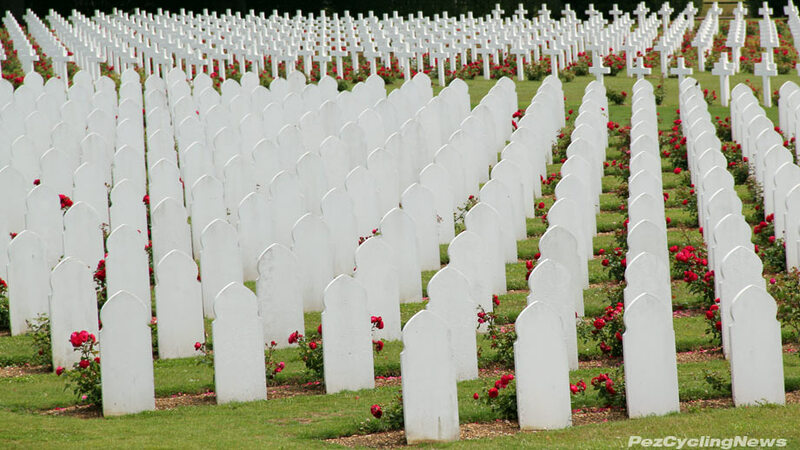 Unmarked graves at the Verdun Memorial. 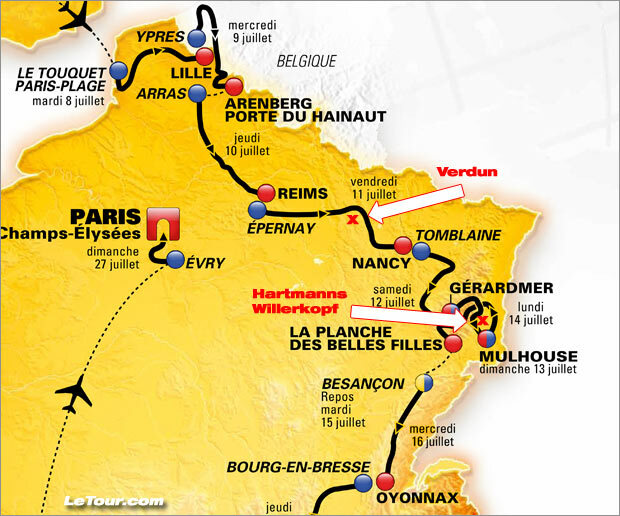 A central theme of the 2014 Tour de France was its recognition of the 100th anniversary of the outbreak of the Great War, and many of the stages ran across historic battlefields. My visit back at le Tour de France that year was interesting for a long list of reasons, but even as my stint chasing the race across northern France for 8 stages began, I was struck by stark and completely contrasting moods my driver Mino and I would experience as this Tour route visited areas of very heavy fighting, and where hundreds of thousands of soldiers and civilians died in the two World Wars. One minute we'd be cheering and honking at French fans, and then around the next turn we'd encounter a somber and sobering memorial of staggering proportions. Stages 7 & 9 were particularly memorable as we passed though sites of carnage so vast that they're almost unimagineable to someone of my generation... certainly they are to me. My first day on the Tour and we drove the stage from start to finish across plains and then into hills that saw some of the heaviest fighting and highest casualties of the war. The opening 60 kms were almost dead-straight and pan flat, and the dark gray sky threatened rain from the outset. 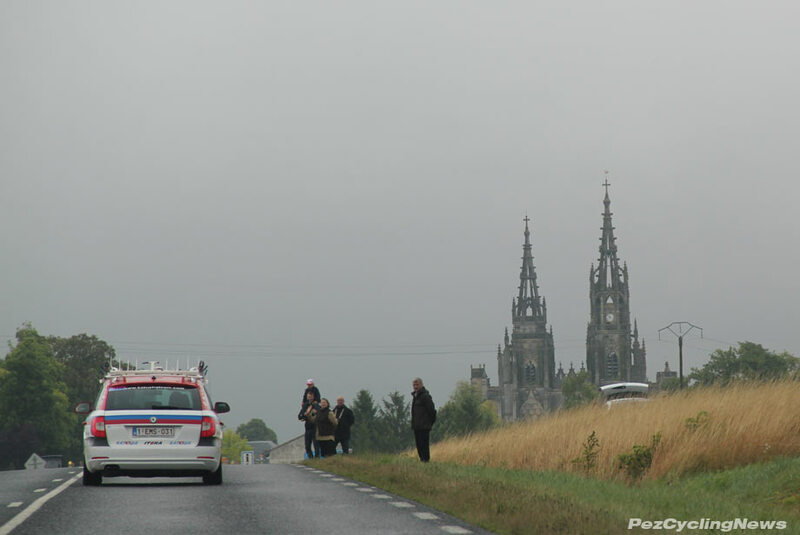 It didn't stop the fans from lining the entire 235km route, but it did set an ominous tone that was much better suited to times of War than to these times of the Tour. 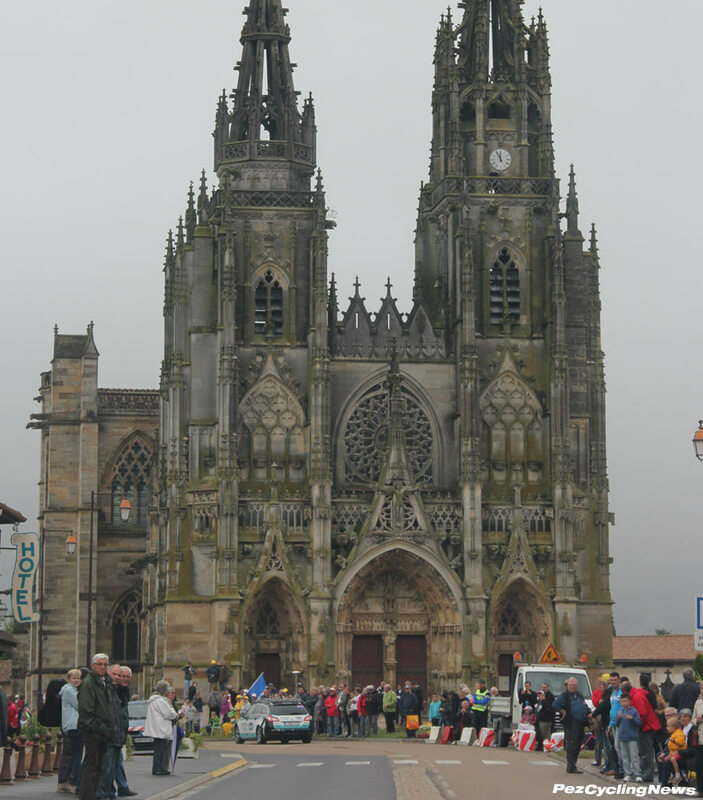 Epernay is in the heart of the champagne region, but along with the bubbly, the region is also famous for some of the heaviest fighting in World War I, and I wondered how this old cathedral had escaped complete destruction during not one, but two World Wars. Around 70kms in, the flat roads shifted to rolling hills and gentle curves. Not far ahead was the town of Verdun - site of one of the most historic battles of the war and where almost a million people died in a year long battle in 1916. 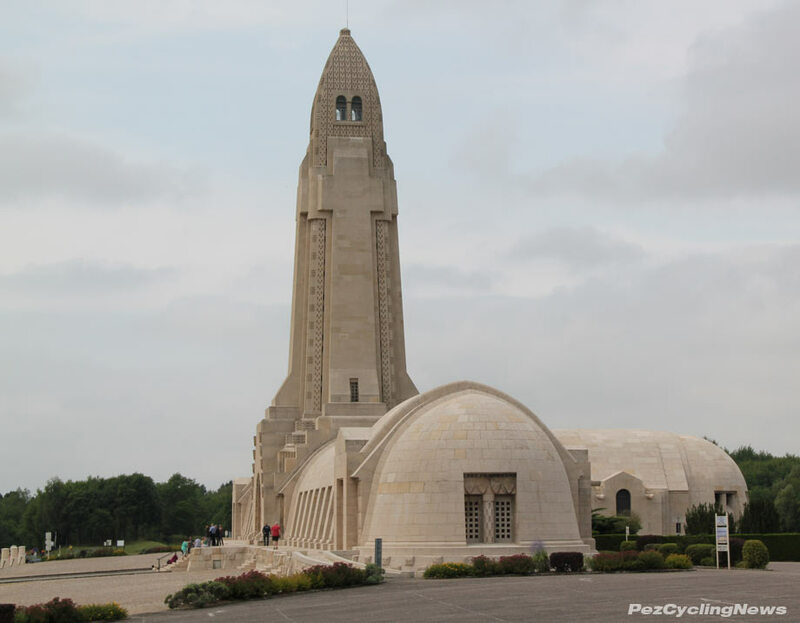 The race passed the Verdun Memorial, one of the biggest and most impressive I've seen, but what really stunned me was a few kms further on. The forest floor was gouged and gashed with berms, large swails, and even craters between tall trees. It became obvious that this was no naturally shaped forest floor, but in fact the aftermath of thousands of artillery shells raining down over many months as both sides tried to exterminate the other. What's left jars the memory more than any memorial ever could. 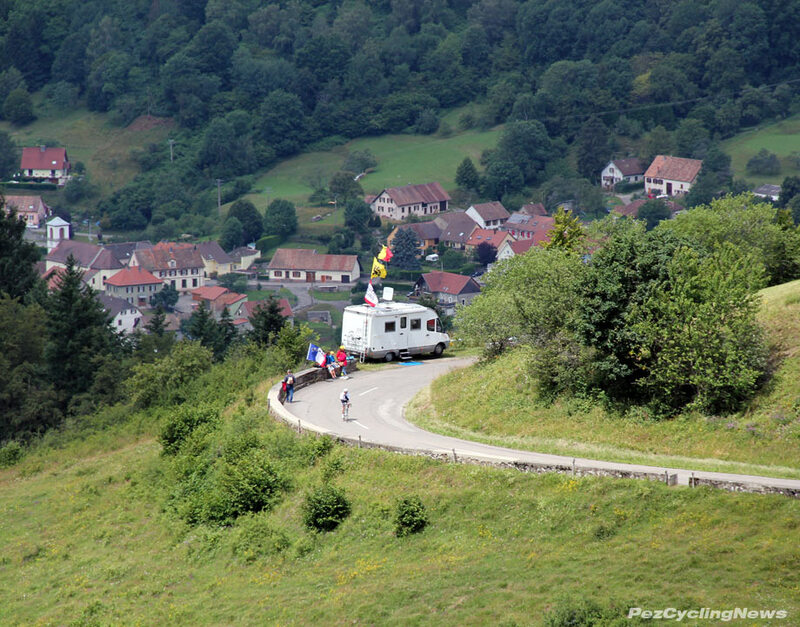 Among other things, the Tour has come to celebrate summer in France - hot days, holidays, and cheering on riders is a national pass time unlike any other. But in this year, as the Tour recognized and remembered a time when life was so completely different from what most of us live today, that traveling through these battlefields was an emotional experience I was not prepared for. It's impossible for me to imagine what life must have been like in those years, but seeing these scarred battlefields were a noteable shock. Stages 4, 5, 6, 7, 8, and 9 all crossed key battlefields along the French-German frontier of 1914 - 1918, and while many like Ypres and Verdun are quite well known, others are less so, but equally staggering in their significance. 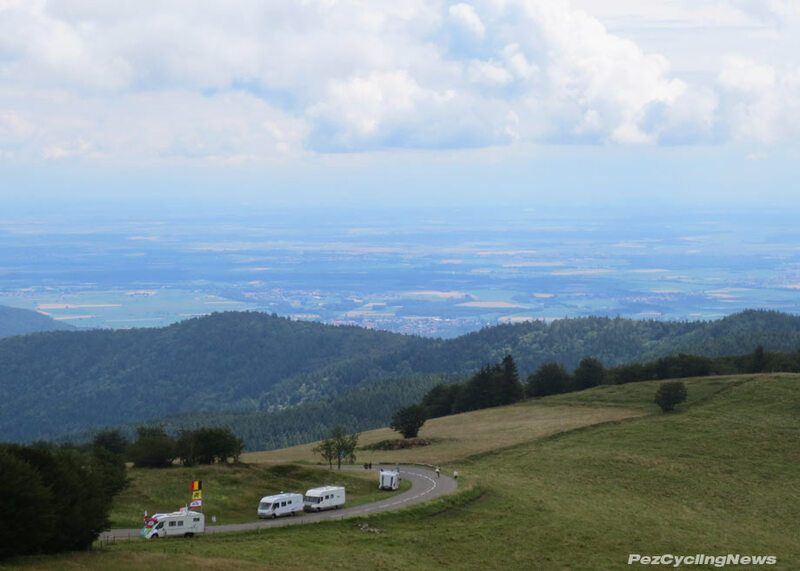 Stage 9 was the second of three climbing days in the Vosges mountains, and featured six categorized climbs, including the Cat.1 Le Markstein and Cat. 3 Grand Ballon, before descending to the finish in Mulhouse. This area of the Alsace had long been a battleground between France and Germany, who fought over its jurisdiction many times in many wars, resulting in a distinct Franco-German mix of people, culture, and food. Over the top of the Grand Ballon awaits some fine descending as the road twists and turns down for almost 20km. I say almost because there's a slight interruption with the unclassified climb of the Col Amic - something like 150-200 meters of uphill before the final long drop to the Rhine valley below. Looking east from the Col Amic, I was at first taken by the beauty of the vista, and stopped to snap this pic and soak it in. The only sound was the wind... peaceful indeed. Then I realized that I was looking towards Germany, and that this area was another of very heavy fighting in the Great War. Seeing the tranquil towns miles off in the distance, I wondered how different life was in those same fields almost a century ago as both sides showered each other with artillery shells. Then not far on, as I settled into my descent, I saw that Mino had stopped the car and was waving me down. To our left was what quickly revealed itself as a massive memorial to a battle I'd never heard of - the Hartmannswillerkopf cemetery. 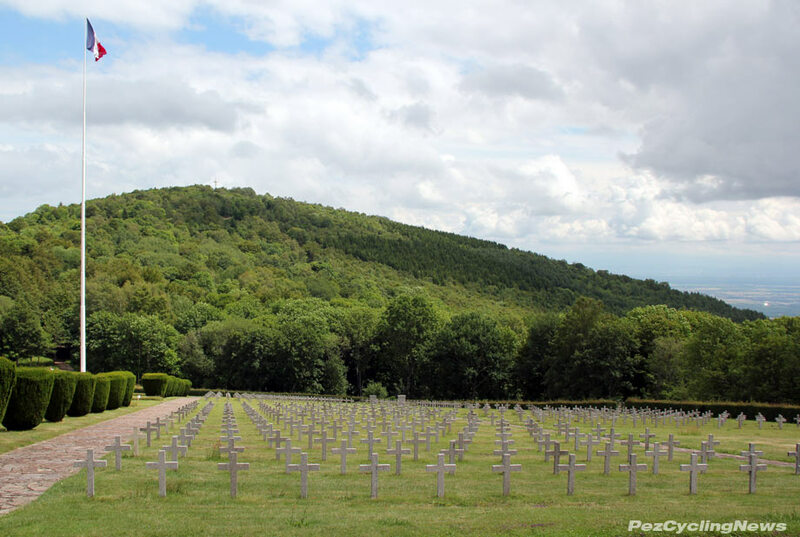 The Hartmannswillerkopf cemetery lies in the midst of the battlefield atop the peak of the same name. Its commanding location high above the Rhine valley made it a strategic position to both sides, who's ongoing battles in 1915 resulted in an extensive network of trenches and bunkers as each side dug in. As the War dragged on, both sides began to divert resources to more active fronts in the north, resulting in a relatively stable line here through the years to the 1918. 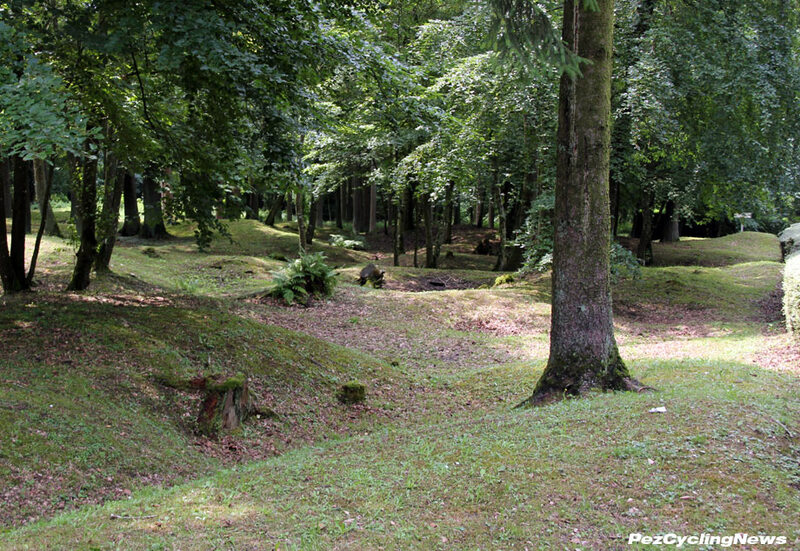 The resulting relatively quiet nature of this front left a series of very well preserved trenches and bunkers that can be explored today in much more peaceful surroundings. 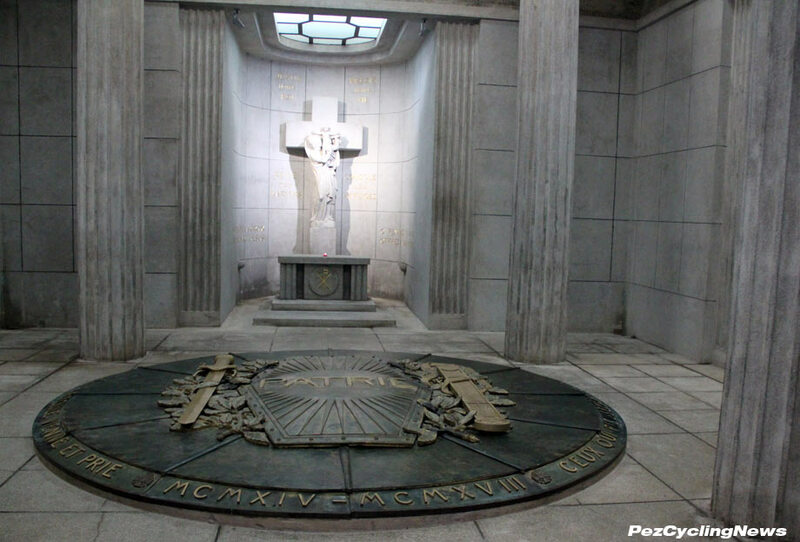 The memorial includes a national cemetery and monument that honours soldiers both French & German who died in battles here. 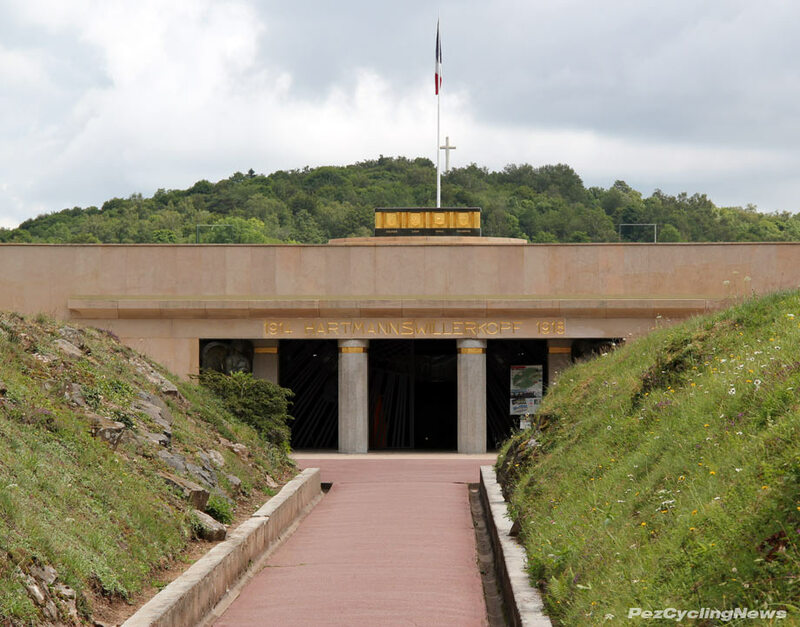 While thousands are buried on graves on the mountain side, inside the memorial is a tomb marked with a shield that measures some 12 feet across. Beneath it are some 12,000 more soldiers – laid here to rest. I’ll remember this edition of the Tour for a lot more than the great riding and thrills of being here – considering I was here simply for what’s nothing more than entertainment – I’ll remember how not so very long ago, things in this part of the world were very different from anything I’ve known… or hope to know. It's worth taking a few minutes pause on November 11th to appreciate the sacrifices made by those before us.